It's hard to believe so much flavor could come from so few ingredients! Not to mention the fact that the fish bakes in about 15 minutes. If you're looking for a delicious fish recipe for a satisfying everyday meal, this is an excellent choice. 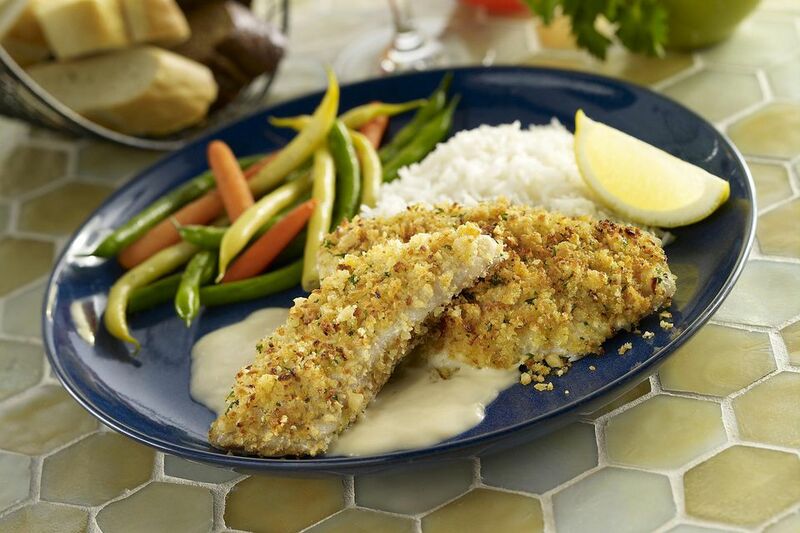 Mild, tasty tilapia is flavored with a Dijon mustard topping. The chopped pecans give the dish a nice crunch. To cut fat and calories, even more, use herbs in place of the pecans or use a reduced fat mayonnaise. Lightly butter a large, shallow baking pan, such as a jelly roll pan. In a small bowl, combine mayonnaise and mustard. Using paper towels, pat fish lightly to dry. Arrange fish fillets in prepared baking dish. Spread mayonnaise mixture over each fillet. Sprinkle each fillet with chopped pecans; press down gently. Bake in a preheated 350 F oven for 12 to 15 minutes, until fish flakes easily with a fork. Use 2 to 3 fillets per person, or 4 to 6 ounces. Serve with broccoli and tomato slices. This is also a good choice if you're trying to lower your carb intake. And feel free to use haddock or pollock fillets in the recipe. Thicker fish fillets will take a bit longer in the oven. Serve with low carb cauliflower rice or mashed cauliflower. If you aren't lowering carbs, serve the fish with mashed or roasted potatoes. Use another type of mild white fish in this recipe, such as pollock, haddock, cod, or catfish.